Subscribe to KOOKIE magazine for 6 months and receive the previous issue as a BONUS (three issues in total)! Offer expires 16.05.2019 or while stocks last. Free Gift applies to 6 month subscriptions only. Available to AUS residents only. Gift is sent to the recipient. 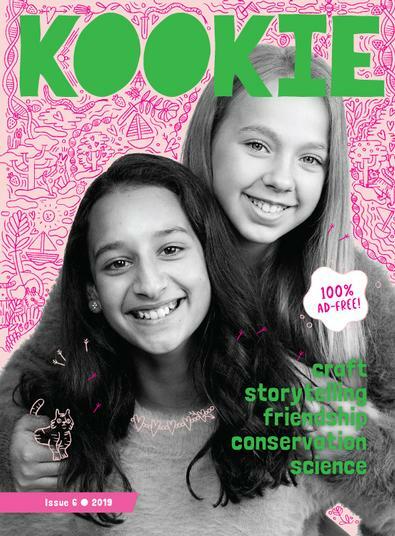 Packed with girl-powered, 100% ad-free content for ages 7 to 12+. Because kids need to ‘see it to be it’, KOOKIE features remarkable female role models, young and old, from around the world. There’s original fiction and comics too, as well as lively features on everything from adventure and activism to science and sport, plus craft, debate, books, pets, puzzles, problems and loads more. A magazine for smart KOOKIEs everywhere! I LOVE Kookie! It&apos;s fun, informative, and there&apos;s something for everyone! I came across Kookie when looking for a magazine subscription for my 8 year old daughter. I took a chance on a magazine I had not heard of before and I am so glad I did, she absolutely loves it! Filled with interesting and engaging content and fun puzzles and DIY activities it keeps her busy for days. The only problem is it only comes out 4 time a year! Keep up the awesome work. For quarterly titles please allow up to 8-11 weeks for your first delivery. Your subscription will begin with the next available issue.